“In the grim darkness of the far future there is only war” is the strap-line that describes life in the 41st millennium. Humanity, having expanded across the galaxy, faces destruction not only from within, but also against nightmarish and brutal aliens. In Warhammer 40,000: Space Marine, a third person shooter developed by Relic Entertainment and published by THQ,Â you lead a squad of genetically engineered super soldiers in a fight to stop a planetary invasion from said aliens.Â Available now for PS3, Xbox 360 and PC, it’s a visceral experience that perfectly portrays the spirit of the Warhammer 40K setting. Given the demographic of the modern gamer, there are probably few people who haven’t heard of the Warhammer phenomena – created by British gaming and miniatures company Games Workshop in the 1980’s. Decades later it is still massively popular and spans numerous media – from table top games to audiobooks, video games to animated movies. A rich tapestry of fiction by artists far and wide, every picture, story or rule becomes a source of information that further develops the bleak and tumultuous sci-fi mythology. Space Marine begins with the discovery of an invasion fleet heading to an Imperial Forge World – a planet covered in factories solely dedicated to the manufacturing of weapons. The fleet is host to an immense army of Orks, a race of green skinned horrible creatures who take pleasure in looting and destruction and have a social hierarchy based purely on who can “crush da most humies”. Not wanting to have their most reliable military assets stripped bare by the Orks, it is decided that a team of Adeptus Astartes (colloquially known as “Space Marines”) must be sent to the planet to hold off the bulk of the invaders while a larger liberation fleet can be rallied. Enter Titus, a Space Marine captain of the Ultramarines chapter (the ones that wear blue armour). Seven feet tall, genetically enhanced to withstand the worst environments in the galaxy, clad in a suit of powerful futuristic armour and trained to know no fear in the face of his foe, he is joined by two of his battle-brothers; Sidonus, an aged veteran and Leandros, an inexperienced rookie. Taking a somewhat different approach to the third-person shooter genre, there’s no emphasis on using cover and slowly wiping out the opposing forces, instead you’re constantly on the move, using your guns as you advance to thin out the numbers of on-screen enemies. The Orks are, for the most part, rather stupid, so they’ll constantly rush your position, hoping to use their numbers as an advantage. Your arsenal begins with a basic machine gun but later expands to include plasma guns, destructive laser cannons and the like. In addition to your guns, you will always carry one melee weapon, by default this is a “chainsword” – quite literally the fusion of sword and chainsaw – but as with the guns, there are several stronger ones waiting ahead. You’ll use these to attack the enemies in a variety of simple, yet brutal, combinations, as well as performing stun attacks that allow you to initiate a finishing move against your foe. Finishing moves are gruesome, vicious and integral to your survival – although the Space Marine armour naturally regenerates over time, your health is only replenished by a successfully completed finishing move. It’s another way in which Relic push you into behaving as the character would – Space Marines don’t cower behind shoulder-height debris, they are always in the heart of the action, turning green skin into red mush in a matter of seconds. There’s a rather simple plot that sees you traversing the various sections of the Forgeworld – from crash sites to sewers, munitions factories to gothic bridges – but it is presented in a consistent and enjoyable manner. There’s some excellent voice acting – the Space Marines come across as the well-spoken gentry, sorting out the cockney riff-raff that is the Orks – and the accompanying soundtrack is suitably rousing, though lacking in a standout anthem by which to remember it. Outside of the campaign, there’s a 16-player multiplayer mode, which sees up to eight Space Marines fighting against eight “other” (potential spoiler, sorry)Â Space Marines in two different game types – territory possession and a deathmatch. 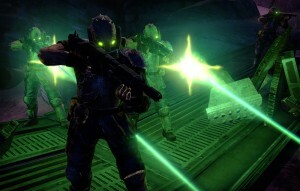 Both games are easy to grasp, but will be difficult to master due to the wide range of customisation that is available to the player as they progress the ranks.Â With three different class types, a multitude of unlockable armour sets, weapons and perks, players have near limitless choice in creating their own, perfect, soldier. New players won’t be at too much of a disadvantage though, as being killed by another player grants you the option to borrow their loadout, letting you play with the big guns, at least until you die again! A lot of the official Games Workshop “chapters” make it into the game, but you can completely customise every piece of armour using the same range of paint colours that Games Workshop sell in their shops, if garish pink and orange is your thing – you can do it! One moot point for multiplayer gamers, if you’re buying this game second-hand or renting it you will need to buy an “online pass” that allows your character to advance beyond a very basic level. I’m not sure to what extent this contributed to the dearth of online players when I played the game in it’s opening week – there were usually about 20 joinable games each time – but it’s easy to construe it as a poke in the eye to people who want to enjoy the Warhammer experience but are on a limited budget. 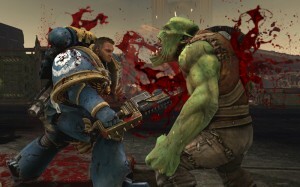 As a fan of the franchise I came away from Space Marine thoroughly satisfied, though as a gamer I couldn’t help but wish for a little bit more. 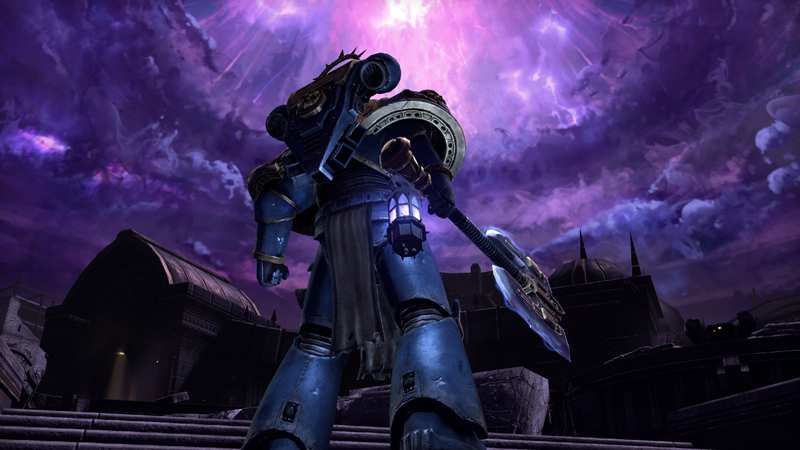 The lack of a co-operative campaign is the first real sticking point, seeing as you spend the bulk of your time accompanied by two other Ultramarines, why couldn’t they have been playable by my friends? Secondly, there were several occasions where I was able to embed myself within scenery and no longer move. This required restarting from previous checkpoints, and became rather a nuisance. It feels as if Relic are merely testing the waters with this title, with larger, more ambitious plans in the pipeline should it prove a success, though perhaps I’m reading too much into the closing parts of the plot. 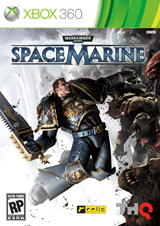 Regardless of its obvious comparisons with other sci-fi themed third person shooters, Space Marine differentiates itself enough to stand out from that crowd and is a great example of how to adapt an already well established intellectual property into an exciting and challenging video game. It’s not perfect, but it’s bloody good fun. 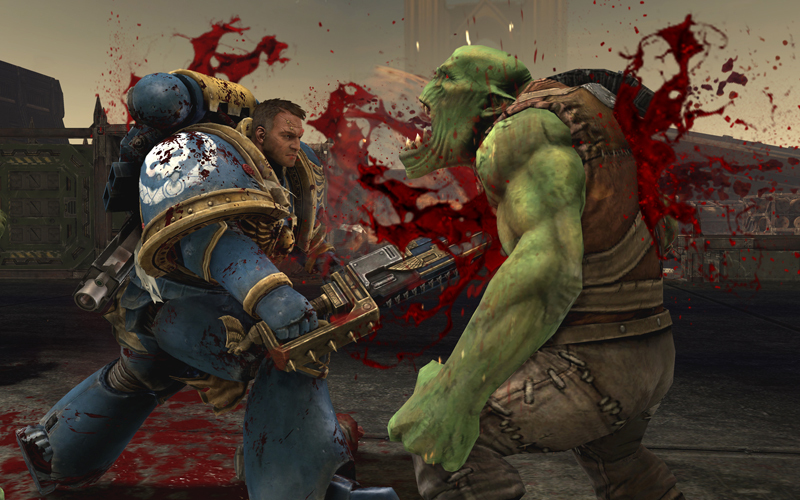 Warhammer 40,000: Space Marine scores 8 out of 10. This entry was posted on Sunday, September 18th, 2011 and is filed under Computer Gaming, Featured, PC, Playstation 3, Xbox 360.